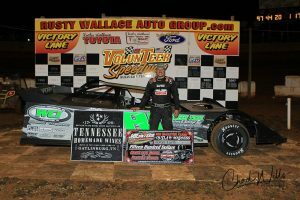 BULLS GAP, Tenn. (June 2, 2018) — Before one of the biggest crowds ever Saturday at Volunteer Speedway, the World of Outlaws Craftsman® Late Model Series made a much-anticipated return for the first time in a decade to “The Gap” for running of the $10,000-to-win East Tennessee Shootout. 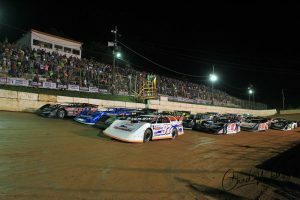 Much to delight of the partisan home-state fans packing the grandstands, three-time Lucas Oil Late Model Dirt Series national champion Jimmy Owens of Newport, Tenn., passed Chris Madden for the lead on lap 47 en route to stealing the win from Madden who currently sits atop the World of Outlaws points leader-board. “Man, that was a heck of a race there between me and Chris (Madden), and I hope the fans enjoyed it,” a smiling Owens said after climbing from his car on the front straightaway in victory lane before loud cheers from fans “You could race anywhere on the track you needed, either down low on the bottom, in the middle or right up against the (guardrail) on the top-side. With the race going caution-free the whole distance, when we began lapping cars at back of the field I was trying to figure out whether to try sneak by Chris to the inside or surprise him with a run on the outside. There with just a few laps left I got a good run and was able to pull off the pass for the lead. 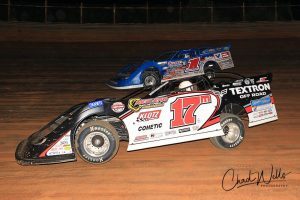 Madden was quickest in qualifying at 13.085 seconds and went on to win the first heat race, with Owens winning the second heat, and the third heat was won by Michael Chilton. 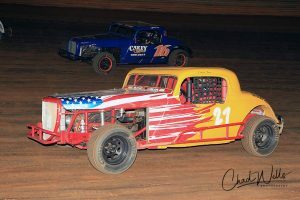 Following the redraw for starting positions among the heat race winners and second-place finishers, Chilton and Madden led the 24-car field to green from the front row. Chilton jumped out to the initial lead over Madden, Owens, Brandon Sheppard and Dale McDowell. With Chilton showing the way out front, Madden began pressuring him trying to grab the lead as Owens lurked ready to pounce should Chilton and Madden get together. 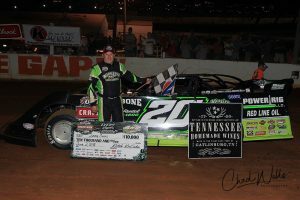 Just behind the lead trio Sheppard, McDowell, Chase Junghans, Mike Marlar, Chris Ferguson, David Breazeale, and a host of others were jockeying for real estate. Madden drove under Chilton racing off the fourth turn on lap 13 to take the lead, which opened the door for Owens to make his move to get around Chilton just one circuit later for second place. Just before the race reached the halfway distance, McDowell passed both Sheppard and Chilton to move into the third spot, about 6 car lengths behind Madden and Owens. 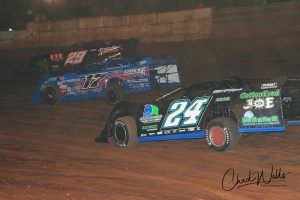 With Owens shadowing Madden up front as the leader worked slower traffic once they began the lapping process, McDowell closed in to make it a three-car battle. 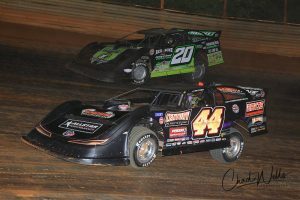 Owens managed to stick his nose up under Madden racing off the corners on several occasions, but lap-after-lap Madden managed to hold Owens back. At the flag stand with the 5-to-go signal given, Owens turned up the heat challenging Madden. 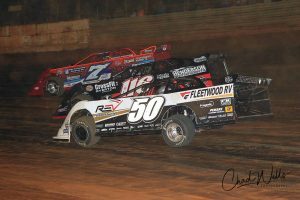 Owens used a lapped car in front of Madden to his advantage to make his move to pass Madden for the lead on lap 47, and once in front the “Newport Nightmare” would not be denied the big $10,000 payday. 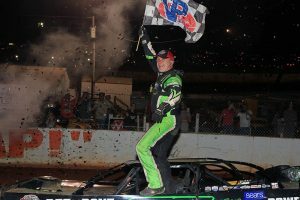 Owens recorded the win over Madden, McDowell, Chilton and Sheppard. … Completing the top 10 finishers were Junghans, Marlar, Casey Roberts, Shannon Buckingham and Ferguson. Heath Alvey was quickest in Crate Late Model qualifying at 13.731 seconds, with Jensen Ford of Jonesborough close behind at 13.739. With a strong field of 30 cars assembled and the top-18 from time trials locked in, a B-main was held to determine the 24-car starting field. 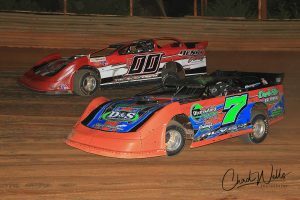 Ford jumped out to the lead on the start over Alvey, Rusty Ballenger, Josh Henry and Logan Roberson. Henry wasted no time quickly getting around Ballenger for third on the second lap. An early caution waved when Trevor Sise and Jody Horton tangled between turns one and two. Off the ensuing double-file restart, Ford powered back out ahead while Alvey and Henry battled for second place. 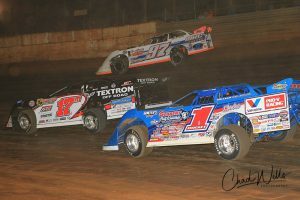 The action behind the lead trio back through the field involving Ballenger, Roberson, Ross White, Drew Kennedy, Brandon Williams, Chase King, Gary Crittenden, Greg Martin, Tim Byrd and Parker Martin saw cars two- and three-wide around the high banks. 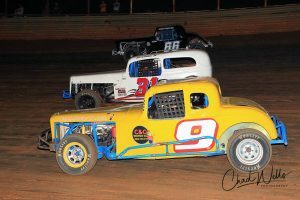 Henry got around Alvey for the runner-up spot on lap 12, while Kennedy was on the move forward overtaking White, Roberson and Ballenger to advance into fourth in the running order. But out front the race belonged to Ford as he captured his first win on the season worth $1,500 over Henry, Alvey, Kennedy and Roberson. 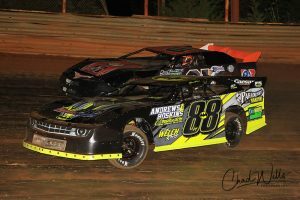 Brad Davis of Tazewell set fast-time at 14.630 seconds in Modified Street qualifying to earn pole position for the 20-lap feature. Davis grabbed the lead at the start over Wayne Rader and Gary Blanken, with caution waving on lap 8 when Robbie Buchanan and Kaleb Trent wrecked between turns one and two. Back under green Davis was showing the way out front, while Rader and Blanken battled for second. 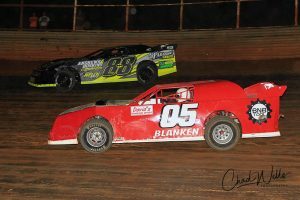 Blanken got around Rader just past the halfway point and set his sights ahead on Davis. Over the final circuits Davis had Blanken applying pressure, and had to hold on for a hard-earned second win of the season. Finishing behind Davis was Blanken, Rader, Shannon Emery and David Clark. 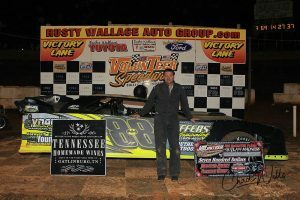 Lee Merritt of Knoxville visited familiar territory – victory lane – following his fifth Classic win on the season. 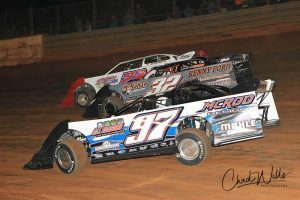 Merritt was chased to the checkered flag by Will Carey, Chris Worsham, Shaun Sise and Eli Keck. 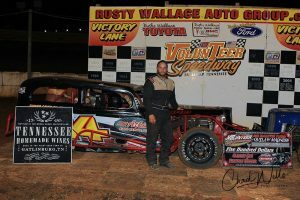 Volunteer Speedway racing action and victory lane images from Saturday, June 2 courtesy of Chad Wells – Wells Racing Photography. 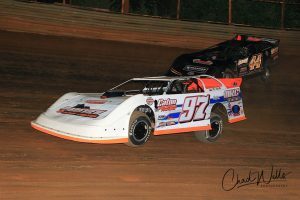 We encourage you to visit www.WellsRacingPhotos.com or www.Facebook.com/WellsRacingPhotography to support Chad by purchasing his outstanding racing images.